The Harvard men’s lacrosse team began Saturday by posting its worst defensive half of the year statistically, allowing 10 goals in the first two quarters to an energized Penn State squad that was playing in front of a large crowd of fans in University Park, Penn. Just as at the end of every other game the Crimson has played this season, however, it had a chance to pull out a victory at the end. On the strength of its third multi-goal fourth quarter comeback this season, Harvard overcame a 12-8 deficit entering the final period to force overtime. Sophomore attackman Morgan Cheek, who collected the winning tally in overtime in the team’s first game of the season, once again found himself in a position to score in sudden death. Nittany Lions sophomore goalie Will Schreiner saved his shot cleanly, however, and initiated a breakaway that sent the ball back into his team’s attack area within a matter of seconds. Then, for the first time all season, an opposing squad scored on the Crimson in overtime. With junior attackman Nick Aponte’s goal, Penn State (5-2) secured a 13-12 victory, its second over an Ivy League opponent this season after beating Cornell in February. Meanwhile, Harvard (4-2) has now dropped two straight games after starting the season with four consecutive wins. The defeat to Penn State was the team’s first overtime loss in four such games this year. The Nittany Lions immediately put their potent offense, ranked in the Top-10 nationally in goals per game, on display in the first and second quarters. After falling behind, 3-1, in the first 10 minutes, they ripped off a 7-0 run in which the entire team got involved. Five different goalscorers paced the surge, and during one three minute stretch at the end of the first period, they found the back of the net five times. Though Harvard struggled defensively in the first half, it’s offense kept the team in the match by responding to the Nittany Lions’ run with one of its own. Crimson senior attackman Devin Dwyer, the squad’s leader in points, scored with 0:09 left in the second quarter to cut the deficit to 10-8. Dwyer and Cheek combined for five goals in the half to pace Harvard. After the two teams collectively scored 18 goals in the first half, both adjusted their game plans at intermission to slow the opposing offense. Penn State managed to pad their lead with two more goals in the third quarter, while Harvard was shut out completely. It was the second consecutive game in which the Crimson failed to score in the third stanza. Trailing 12-8 entering the fourth, however, Harvard once again came to life. It turned the tables on the Nittany Lions, holding them scoreless while scoring four to tie the game at 12. For Penn State, Aponte finished with six points on the afternoon, tallying three goals and three assists. Attackmen T.J. Sanders and Grant Ament also added five points apiece. 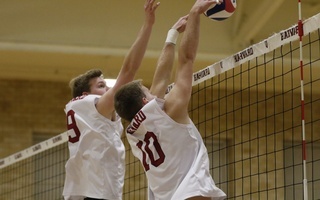 Much has changed in the world of men’s volleyball since Harvard and Penn State last squared off for a conference matchup. 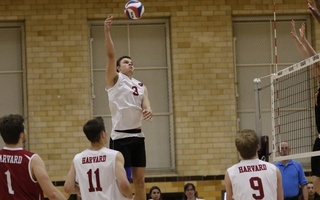 The Harvard men’s volleyball team entered the weekend with a pair of precious possibilities—the chance of marring Penn State’s unblemished conference record on one day and solidifying a playoff position on the next with a win over St. Francis. But the Crimson failed to achieve either objective.